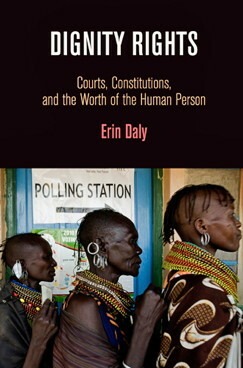 This October, the University of Pennsylvania Press will publish Dignity Rights: Courts, Constitutions, and the Worth of the Human Person by Erin Daly (Widener University School of Law). The publisher’s description follows. The right to dignity is now recognized in most of the world’s constitutions, and hardly a new constitution is adopted without it. Over the last sixty years, courts in Latin America, Europe, Asia, Africa, the Middle East, and North America have developed a robust jurisprudence of dignity on subjects as diverse as health care, imprisonment, privacy, education, culture, the environment, sexuality, and death. As the range and growing number of cases about dignity attest, it is invoked and recognized by courts far more frequently than other constitutional guarantees.